Like 911 for your concrete, URETEK is ready to help. URETEK is capable of rapid mobilization and response in times of structural and geotechnical emergencies and can respond without delay to the most challenging concrete and soil problems. Team URETEK can quickly stabilize dams, sinkholes, spillways and levees, seal leaky infrastructure and realign concrete slabs & foundations using a patented structural polymer. URETEK is no stranger to providing emergency solutions for clients such as the U.S. Department of Defense and the U.S. Army Corps of Engineers. Emergency stabilization of dams, spillways, levees and more. Structural stabilization as a result of water main ruptures and leaks. Emergency soil erosion and sinkhole control. 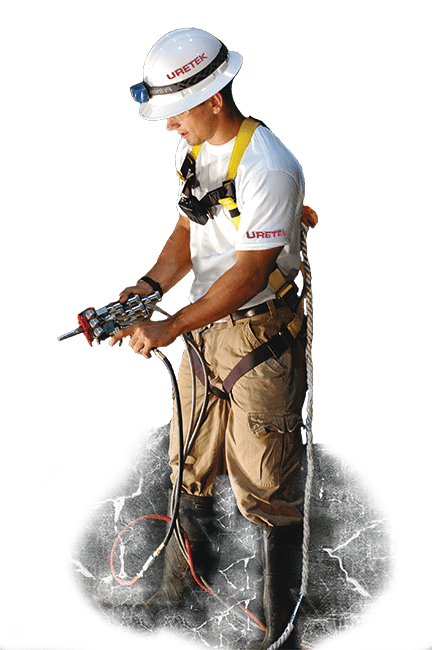 The URETEK stabilization solutions are ground improvement and re-leveling techniques that raise concrete slabs and fill voids using the regulated injection of lightweight, eco-friendly, non-hazardous expanding structural polymer. The URETEK polymer material used in URETEK’s soil stabilization repair solutions, can fill voids and level concrete in weak or unstable soils. The URETEK polymer is designed to resist and remove high moisture content from the soil. With it’s hydro-insensitivity, the URETEK polymer maintains good compressive strength and rigidity even when injected directly into flowing water. Bring stability back to weak soil conditions.